It's time again for another Colour INKspiration blog hop. 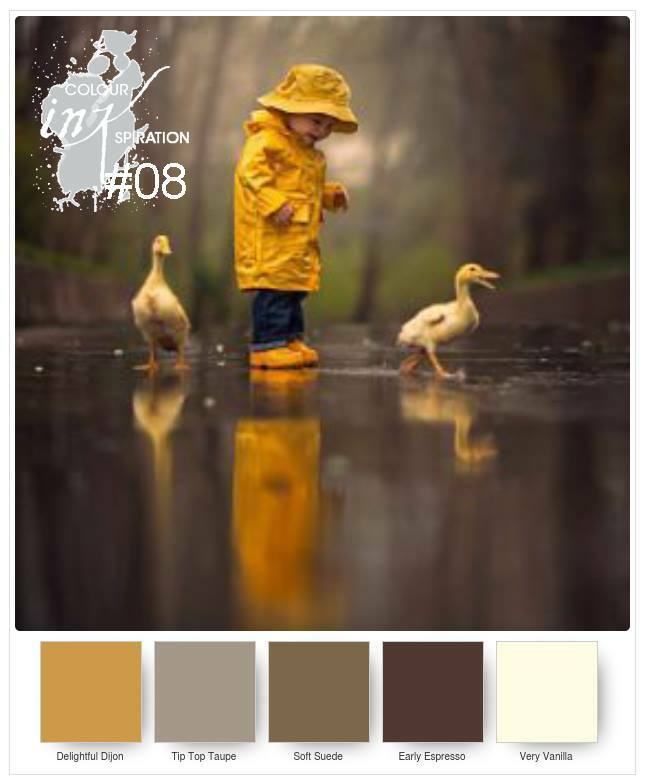 Today we are working with some lovely earthy colours. I have to admit I have never used these colours together. I haven't used Tip Top Taupe or Delightful Dijon in ages so I am giving them one last hurrah before they leave us to make way for 5 new In Colours. What comes to mind when you see these colours together? 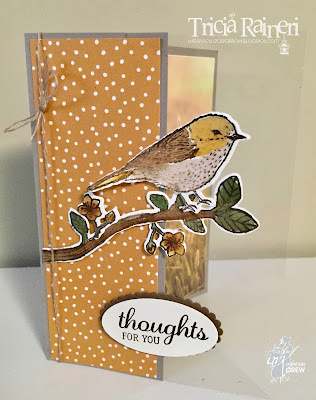 I had an aha moment & decided to use my Best Birds bundle. 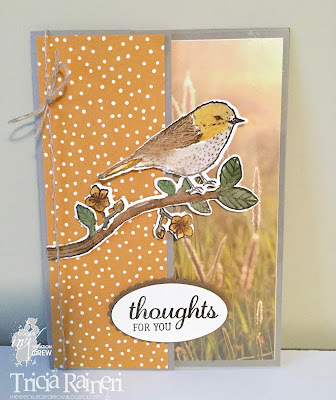 Surprisingly I have never inked up this stamp set, even with a blog called the Speckled Sparrow! 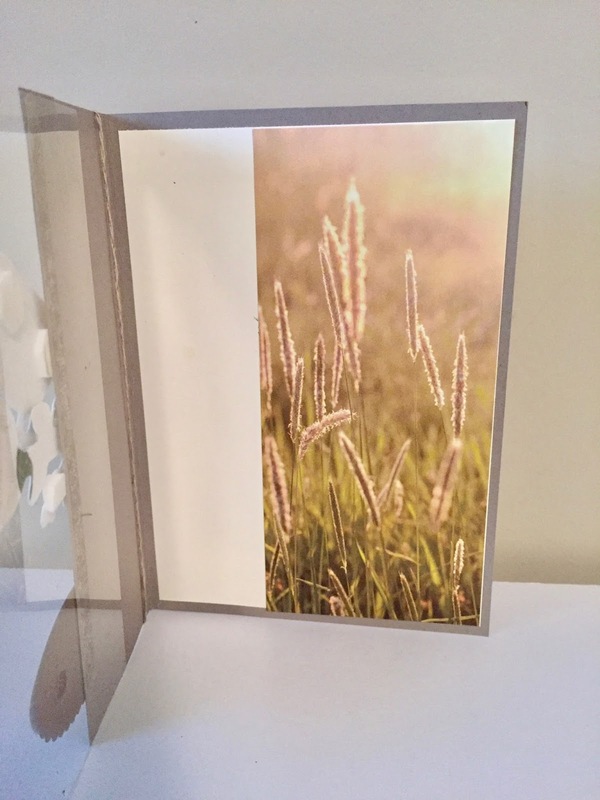 I have to say after making a few cards today with it I really love it. So, today as you can see, I have made a card for ME! It's an interesting concept isn't it, making a card for yourself. What would you make yourself? Have I totally lost the plot? As you can see this card is a little different. 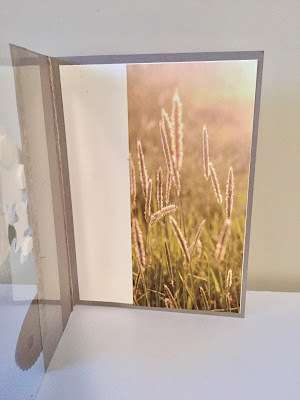 It has an acetate panel so you can see the beautiful grassy sunrise or is it a sunset? I just love that Serene Scenery DSP. The Delightful Dijon spots on the front are also from that DSP pack. I have added a little oval & scallop background for the sentiment. I chose this one for me however, it would make a nice card for any occasion. I stamped my sparrow in Early Espresso onto watercolour paper & let it sit for a little while. I then coloured the bird in using Soft Suede, Delightful Dijon & Tip Top Taupe with an Aqua Painter. I added a smidge of Garden Green for the leaves & a piece of Linen Thread. Here is the inside of the card. I left a vanilla panel to the left of the card to write a little note. I just might send it on to someone else one of these days. 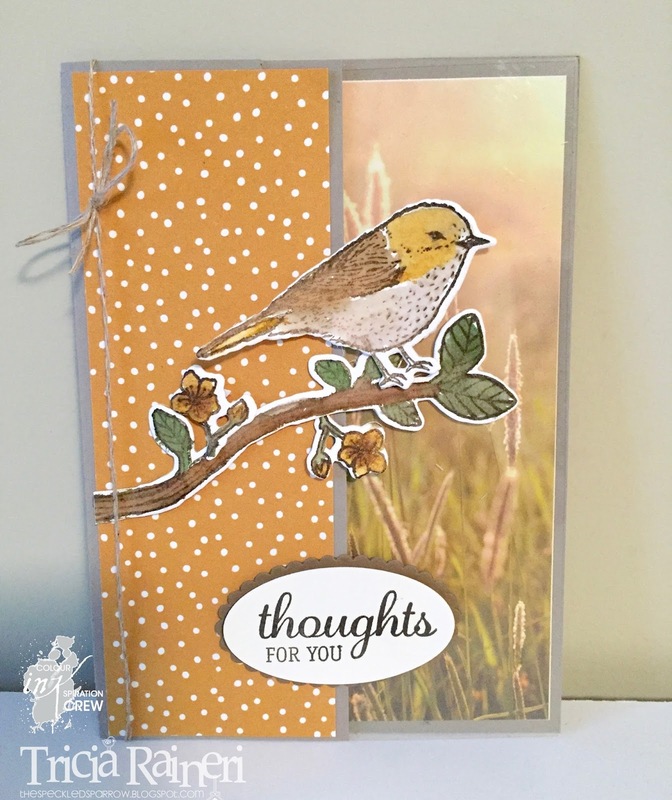 After making this card, I am really sad to see these colours retire! During the week I made another card using all carrying over items plus a little bit of a sneak peek NEW stamp set & punch, using the same bird. 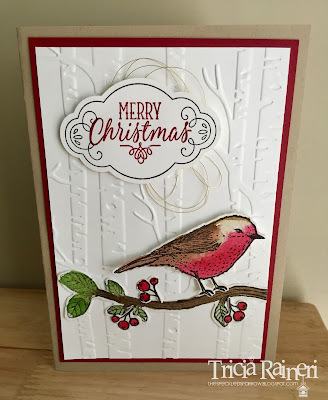 I have used the new In Colour Berry Burst ink for the little bird's belly along with Cherry Cobbler. 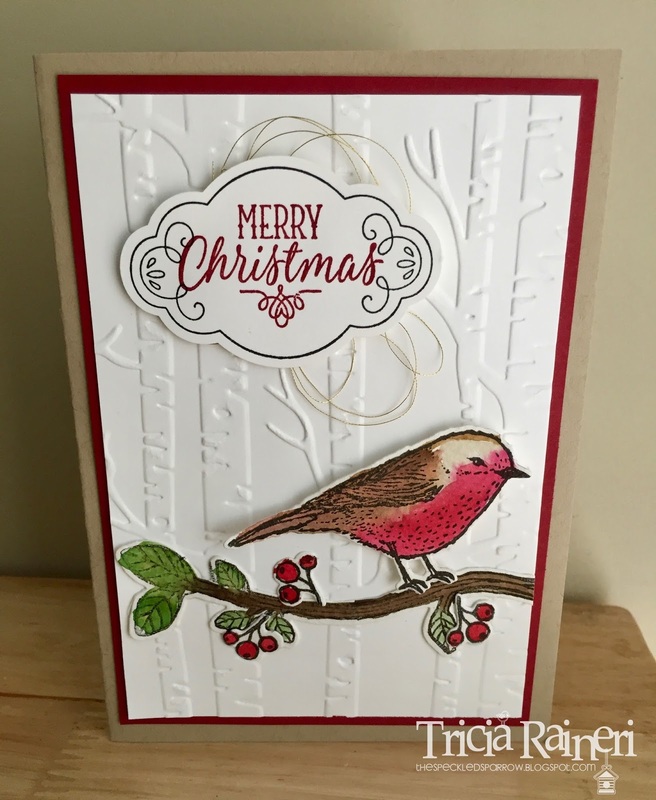 The sentiment is from Hang Your Stocking stamp set & the lovely new punch & stamp set sneak peek is a new bundle coming soon called Label Me Pretty. Next on the hop is Denita with her lovely project. 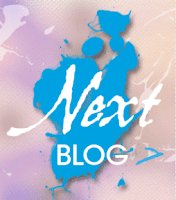 Click the next blog button to head on over to her blog & continue the hop.